It's release day for Navy Quinn! Oh my I love her. She's full of spice and after being the older sister to five tough brothers she is small but in charge! I hope you love the story. Find Her Too-Perfect Boss on Amazon. A sassy fitness expert, the irresistible man she refuses to fall for, and the tropical storm that will change everything. 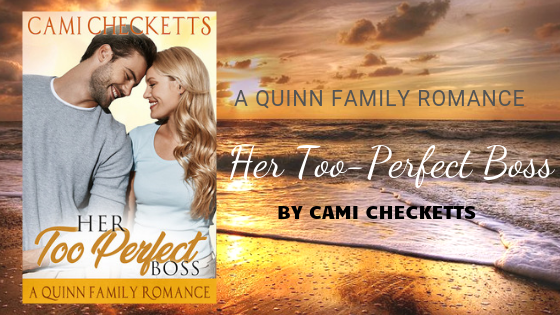 Navy Quinn has been dodging her perfect boss for over a decade, but a week on a remote island might prove to be her downfall with the tantalizing billionaire Holden Jennings. Holden travels to paradise to take part in the finale of the reality TV show that he sponsors, Muscle Up. With the feisty Navy Quinn as one of the show's top trainers, he needs to fight hard to stay immune to her charms. When a hurricane strikes the island, the crew is forced into a storm shelter to save their lives. Navy and Holden have to protect everyone on the island and allow their hearts to be softened to the love they've been avoiding. Can a near-death experience bring them together or will it kill their chance at love?